3) The growing speculation that there will be upward pressure on JPY due to repatriations towards end-FY2018 (March 2019). These factors, however, have likely supported the JPY bottom. After a short-lived flash crash spike at the turn of the year, Yen vols have resumed their downtrend and are well on their way to testing their lows from 2Q’14 (refer 4th chart). The break of 8.0 on USDJPY 1Y ATM vol back in December had caused a frisson of excitement among vol accounts looking to buy Yen vega as a strategic late cycle FX vol play, but what was deemed to be a key technical support level has long since been left in the dust. 7.0 now looms as the next major target, beyond which there is still substantial room to fall to revisit pre-GFC levels in the 6s. It is difficult to argue with option prices steadily softening when the spot is stuck in a tight 109-111 range and delivering 2-2.5 pts. below implieds. There is also a case to be made that the ongoing softness in realized vols can continue longer than some anticipate, since the propensity of the Yen to rally in market downturns is being dampened by a cyclically wide US-Japan interest rate differential that is fuelling above-average equity and FDI outflows, alongside a reduction in FX hedge ratios of traditionally well-hedged foreign bond purchases. 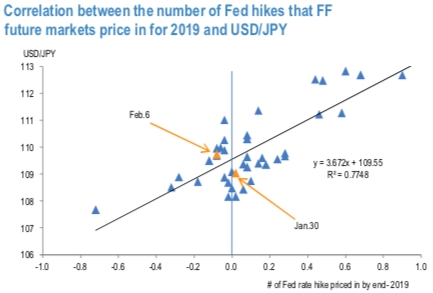 The number of Fed hikes that the FF future markets are pricing in for 2019 has continued to have a relatively strong correlation with USDJPY (refer 1stchart). FF future markets did not price in any hike even before the FOMC on January 30th. Currency Strength Index: FxWirePro's hourly USD spot index was at 49 (which is bullish), while hourly JPY spot index was at 29 (bullish) at 07:18 GMT.